The next one to follow is also another Biff Rose number. I’m a bit keen on his songs, I think they are very good, very funny. He’s a very overrated, er, underrated songwriter, sorry Biff, and he’s been working in America for about five years and nobody over here is buying his records, and not many people in America seem to either, and the album this comes from is called The Thorn in Mrs. Rose’s Side and it’s a good album to buy. It’s called “Buzz The Fuzz” and it’s a Los Angeles song. David Bowie, Friars Club, Aylesbury, 25 September 1971. Bowie had a taste for musical eccentrics, those further out on the limb then he ever ventured, whether it was Ken Nordine’s “Word Jazz” LPs or the odd figure of Paul “Biff” Rose. Rose was a banjo-playing comedian, born in New Orleans, who worked with George Carlin on various TV shows in the ’60s, including Mort Sahl’s, while releasing a series of comedy records. “Buzz The Fuzz” is off Rose’s 1968 LP The Thorn in Mrs. Rose’s Side (as was “Fill Your Heart,” which Bowie also covered) and the song’s your basic sort of hippie drug humor, involving a rookie LA cop and the femme fatale he encounters, Alice Dee (rim shot). Removed from its narrow cultural/generational niche (Robert Christgau, watching Rose tweak Johnny Carson in 1969, admired Rose’s “hip aplomb” and ended his blurb with “Hurray for longhairs”), the song now seems smug and unfunny—a poor translation from a dead language. First played at a BBC session on 5 February 1970, where Bowie sings it in a sideshow freak’s voice. While he kept “Buzz the Fuzz” in his stage repertoire until 1972, he never recorded it. 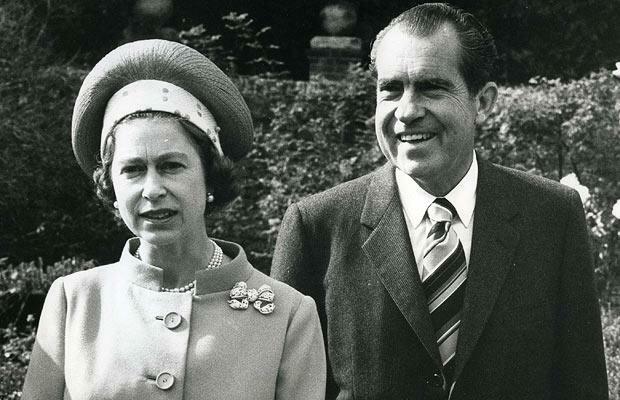 Top: Nixon meets the Queen, 3 October 1970. Elizabeth seems nonplussed.